India has been a global leader in providing electricity access to its population. A recent IEA report found that 500 million of the 1.2 billion people who have gained access globally since 2000 live in India. While 300 million rural Indians remain without power connections, the Indian Government has set a target of December 2018 for universal household electrification. Decentralized renewable energy solutions, such as rooftop solar and green mini-grids, will have to play a central role in achieving that ambitious target. But simply connecting people to electricity is just a first step. The true impact arises from the services that electricity enables. In recent months, a variety of initiatives from the private sector, government and civil society have revealed the socio-economic benefits of electricity access and the importance of SDG 7 (Access to affordable, modern, reliable and sustainable energy) in achieving many if not all SDGs. A recent groundbreaking report showed that introducing rooftop solar to village health centers had a positive impact on delivery of health services in rural India, where 38 million households rely on health centers without electricity. On average, facilities with solar treated 50% more out-patients each month, admitted a higher number of in-patients, and provided round-the-clock services. Staff also had positive perceptions of solar, with about 98% reporting lower disruptions in day-to-day functioning. In addition, more than 80% of health centers reported savings in electricity costs. It appears likely that a pilot program in Chhattisgarh state will be rolled out nationwide. 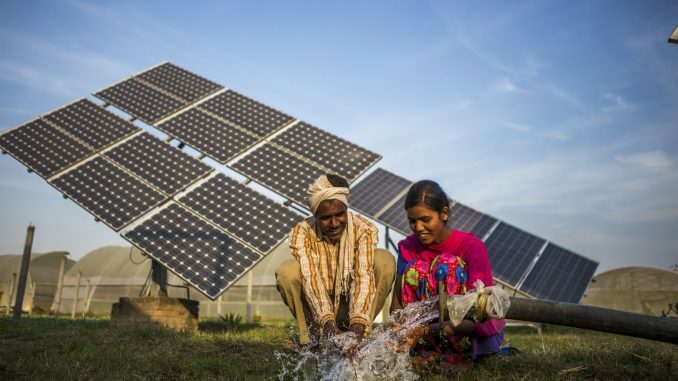 Perhaps the most exciting outcome of distributed renewables is their impact on women. Examples that demonstrate this potential include: companies like Frontier Markets empowering thousands of rural women to become sales agents for solar products (on average making an additional US$400 in income); a project providing access to electric rice hullers that resulted in a 100-fold increase in output; or the UN training program ‘Women’s Entrepreneurship for Sustainable Energy.’ Today, only 20% of the global renewable energy workforce are women, yet women entrepreneurs can demonstrate more than twice the business capacity and success of men. To be sure, more work is needed to fully include women in the country’s energy future, but there are now positive case studies that can serve as a roadmap to replication and scale. India has 138 million households without access to treated drinking water. Innovative solutions that bring together reverse osmosis filtering technology and mini-grids are showing encouraging results to solve this problem. In one location in Haryana state, a water treatment plant is running 10-15 hours a day, providing clean and affordable (US$0.002/liter) drinking water to 1,000 homes, and producing 2,000 liters of potable water every hour. Similar plants are being set up in other states such as Uttar Pradesh and Bihar. An integrated approach to the SDGs must place last-mile electricity access and SDG 7 at the heart of the race to end poverty and ensure a sustainable future. Conservative estimates show that last-mile electrification for rural consumers using distributed solutions could create 862,000 jobs in the near-term. The Ministry of New and Renewable Energy (MNRE) launched the ‘Suryamitra Skill Development Program’ to support training of 50,000 skilled solar PV technicians by 2019. Meanwhile, initiatives like ‘Sustainable Power for Rural Development,’ which is working to commercialize rural mini-grids, has shown encouraging results. Villages connected to mini-grids showed a US$18.50 per capita increase in GDP+, which measures economic GDP and a valuation of social and environmental benefits. Furthermore, 11% of micro-enterprises expanded their businesses since connecting to a mini-grid, while registering a 13% average increase in monthly revenues. Recent floods in Bihar, one of India’s poorest states, provided a powerful reminder of the need to build resilient infrastructure, especially since the poor tend to be the most vulnerable to climate change. During heavy flooding in August that affected millions of people, renewable energy mini-grids stepped up to ensure adequate back-up power and played a key role in assisting relief operations. Other disaster-prone states, like coastal Odisha, where cyclones and floods have killed over 10,000 people and impacted millions more in recent years, could also benefit from adopting a more decentralized energy infrastructure. This would allow for faster recovery as decentralized grids can continue operating even if centralized infrastructure fails. These examples show that stronger evidence is emerging on the benefits of electricity access through renewables and distributed energy infrastructure. They also remind us that an integrated approach to the SDGs must place last-mile electricity access and SDG 7 at the heart of the race to end poverty and ensure a sustainable future. WILLIAM BRENT is the Director, Communications, Media and Content, Power for All.